This manufacturing company is offering an immediate position for a CNC Machine Operator. You will follow blueprints, enter numbers, and load and operate CNC Machines. Training will be Monday through Friday, from 8 a.m. to 4:30 p.m.; however, after training, you will work 4 ten hour days. Qualified candidates must have previous CNC machine operation experience, must be safety-conscious, and must have work boots. 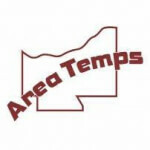 For over 25 years, Area Temps has been committed to providing Northeast Ohio companies with office staffing services, technical, skilled trades, industrial and professional staffing solutions. We measure our success by the thousands of people who have accepted permanent positions with our client companies, either through a direct hire or after successfully completing an initial temporary assignment.